Charting the Open Seas… so you don’t have to. 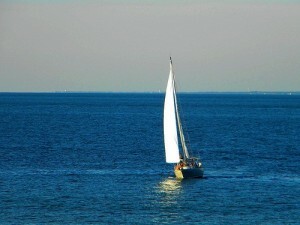 Home / Blog / Charting the Open Seas… so you don’t have to. I can’t tell you the number of times Saylor.org has been mistaken for Sailor.org. Michael Sailor? The Sailor Foundation? No. We are The SAYLOR Foundation. We think education is too expensive and are working to make it free for those seeking an alternative via the totally awesome (and yes, totally free) educational website: www.SAYLOR.org. But here’s the thing— I secretly kind of like the accidental misnomer (aside from the fact that www.Sailor.org takes you to a site that features a palm tree and the words maritime, chronometer and Lake Michigan on the homepage). Maybe it’s a stretch, but I see some similarities between the experiences of a sailing ship and the mission and work of Saylor.org. Harnessing technology to make education free. Fortunately, we’re in good company and are riding the current produced by our trailblazing predecessors; a LOT of really great free college-level content is being developed and shared with the world by organizations like MIT OpenCourseWare, Open Yale Courses, Khan Academy, and more! Individual professors are sharing their lectures, course notes and even textbooks for free online. So, if you’re looking for great free educational content, then listen to your mother—she’s right. There are lots and lots of fish in the sea. But how are you supposed to know how to find them? We’re all very lucky that these killer resources exist on the World Wide Web (or “open seas”). But many of these resources are floating adrift, unattached to a specific course or curriculum. Alone, they are fantastic pieces of content….but when paired with other resources and put into the context of a course, they could be even more powerful. If a student has never taken a particular course before, how is he or she to know within what context each isolated resource exists? In the same vein, how can content creators avoid recreating the wheel if it’s a struggle to identify whether that piece exists or is merely drowning in a deep sea of Google search results? Enter Saylor.org. Our team of professor consultants put together what you could call a “sail plan.” They’ve drawn the “maps” to each of the courses generally offered in 12 of the most popular college majors in the United States. These maps guide you through each course—from all the readings, lectures, assignments and exercises—to the final exam at the very end. The courses will only point you to free web-based resources and are intended to guide you through all of the concepts addressed in this very course taught a traditional university. The professors don’t stick around to “teach the course” but they’ve built in enough guidance to let YOU man the helm. We’re taking content and putting it into context so it’s easier for you to use. Other nonprofit organizations in the realm of Open Educational Resources (OER) are working hand over fist to make some impact on the affordability of learning. Members of the OpenCourseWare Consortium and the Washington State Board for Community and Technical Colleges (SBCTC) are among the giants making their way in content creation. MERLOT, OER Commons and others have built fine repositories, while commercial outlets like iTunes U and YouTubeEdu have made learning a popular online hobby. Peer 2 Peer University (P2PU) and OpenStudy provide a space for users to learn together. But that navigational aid was still missing….a google search or a wikipedia query will only get you so far. We have chosen to define academic pathways in terms of college courses and majors. By vetting, curating and developing resources within this framework, we make it possible for an individual who has (to date) been excluded from the traditional education system to work along a path of higher education similar to that of his matriculated counterparts. Content in context—that’s the difference. As any vessel gears up for its maiden voyage, its crew inspects the rigging, checks the vital fluids, researches the currents and conditions of the sea….but no departing crew really knows definitively what lies ahead in uncharted territory The same is true with Saylor.org—we are experimenting, learning and constantly swinging the compass along the way. The one thing we’re sure of is that education is too expensive, too exclusive and that the sum of human knowledge should belong to everyone. Don’t get us wrong—the age-old tradition of brick-and-mortar institutions and teachers truly invested in their students’ success make for an irreplaceable experience. But shouldn’t we provide an alternative to those who aren’t afforded the luxury of real live professors and constant feedback? Shouldn’t we make it our duty to empower those motivated individuals who wish to educate themselves? Saylor.org was started as a portal for free post-secondary level courses. Our plan, however, is to one day map the educational voyage from Kindergarten all the way through PhD. It seems that the advances in technology and the rapid growth of global internet connectivity have made it possible to deliver this coveted cargo to the world for free. We know it’s possible- and we’re ready to make waves. This is our blog. Welcome aboard. This is great imagery for Saylor. As a curator of OER, you really charting the open seas. The Open Course Library of Washington State is thrilled to be sailing with you!